The Prime PBR and R Panels are a durable, energy efficient and time-saving roofing and siding material. Low-maintenance, and impact resistant, they offer many advantages over conventional roofing and siding. The Prime PBR and R Panels are offered in many color options, making each a great choice for your next project. *32’ Custom Trim Capabilities may vary based on store location. 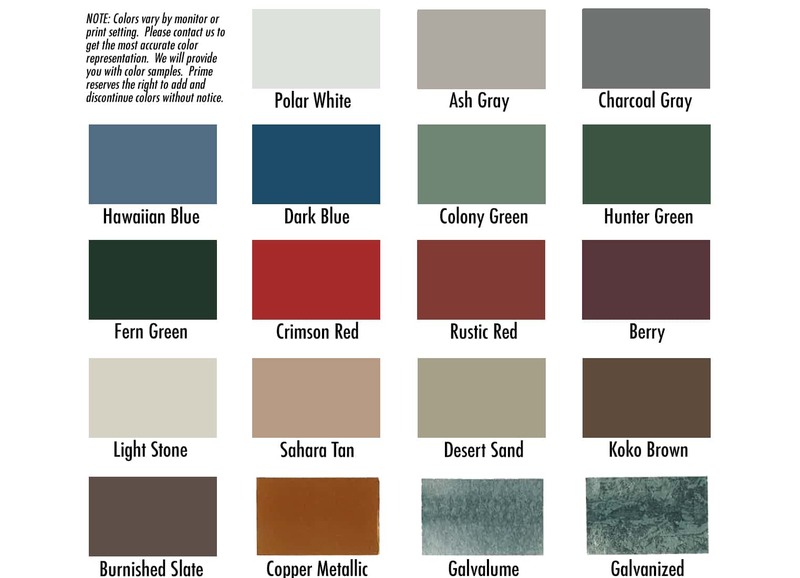 Polar White, Ash Grey, Charcoal Grey, Hawaiian Blue, Dark Blue, Colony Green, Hunter Green, Fern Green, Crimson Red , Rustic Red, Berry, Light Stone, Sahara Tan, Desert Sand, Koko Brown, Burnish Slate, Copper, Galvalume.